Herd4Christ officially began in 2005 as a campus outreach effort of the 26th Street church of Christ in Huntington. 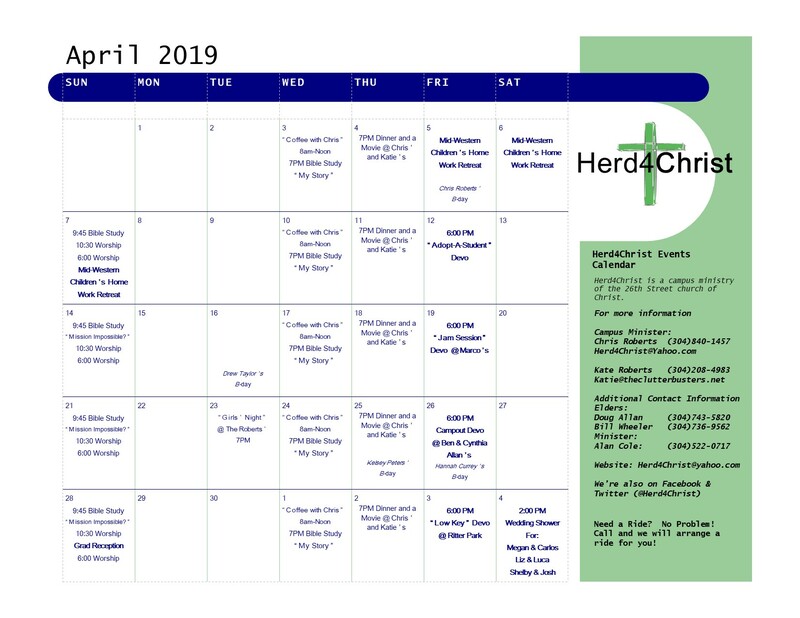 Composed of young adult Christians seeking non-denominational, Christ-centered service, Herd4Christ is dedicated to strengthening the faith of our members, building lasting relationships with one another, serving the community, and reaching out to the students of Marshall University. An officially recognized campus organization, we provide a number of activities on and off campus to help us grow closer to God and have fun. · A church home - The 26th Street church of Christ offers its Marshall student members carpools to services, opportunities to get involved, an Adopt-a-Student program, and an outstanding college-level Bible study program. · Christian friends - Herd4Christ members build lasting friendships, often spontaneously getting together for dinner or to go see movies during the week. · Weekly devotional activities With every devotional consisting of dinner, singing, and a lesson, our “devos” help us build a stronger relationship with Jesus while having fun with others our age. Past activities include putt-putt golf, laser tag, bowling, and outdoor games at Ritter Park. · Chances to serve - Focused on glorifying God through serving others, our service projects include clothing drives, Thanksgiving meals-on-wheels, Habitat for Humanity, and a yearly work trip to Mid-Western Children’s Home in Pleasant Plain, OH. · Caring ministers - With a pulpit minister with a Master’s degree in Counseling and a campus minister, Herd4Christ stands ready to meet the spiritual and emotional needs of our members throughout the year. The 26th Street church of Christ building where we meet for worship.